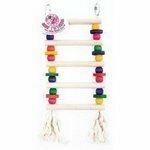 Bird ladders - discounted and fun! Fun ladders for inside or outside your bird's cage. Ladders provide activity and exercise for your companion bird. This reliable wooden bird ladder will help not only your feathered friend's physical well-being but will also provide mental stimulation. Great for giving your bird a challenge and helps make an exciting change in your birds cage. Recommended for small birds, such as Parrotlets, Budgies, Lineolated Parakeets, Bourkes, Cockatiels, Small Conures and similarly sized birds. Recommended for medium birds, such as Greys, Eclectus, Goffins Cockatoos, Small Macaw and similarly sized birds.